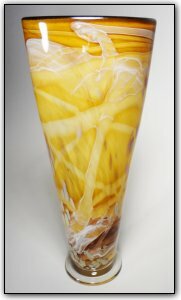 This beautiful tall vase features deep and rich golden amber hues with real sparkling gold accents, along with luscious white highlights swirling throughout and a deep black lip wrap. The interior features an ivory white that contrasts the rich golden amber exterior. The form was hand blown and shaped into a symmetrical contemporary style.